A PROMINENT Chobham villager and legendary RAF pilot during the Second World War has sadly died at the age of 92. Squadron Leader Hugh ‘Jimmy’ Glanffrwd James, who was twice bestowed the Air Force Cross and was also a recipient of the Distinguished Flying Medal, died peacefully in hospital on Wednesday, January 7. He had taken ill while visiting one of his daughters, Sarah, in his native South Wales. Sarah and her sister Jenn were at his side when he passed away. Jimmy joined the RAF at 17 after lying about his age. In August 1942, aged just 19, he was decorated for his bravery in an incident that led to General Montgomery taking command of the Eighth Army in North Africa. As a Sergeant Pilot, Jimmy was on a mission to ferry the newly appointed Army Commander, General Gott, in his Bombay transport aircraft, but it was attacked by German fighters. Gott was killed when the Bombay crash landed and Montgomery – who orchestrated the subsequent victory over the Afrika Korps – was appointed Commander. 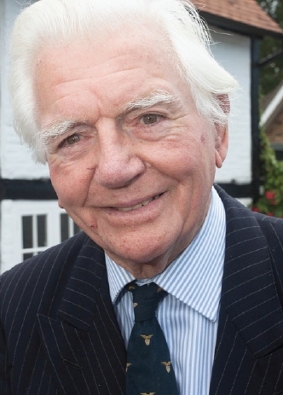 In his later life, Jimmy was Chairman of the Chobham branch of the Royal British Legion and President of Woking’s Aircrew Association, as well as being an active member of the village church and other local organisations. JIMMY’S funeral will be held at Chobham’s St Lawrence Church, at 1.45pm on Thursday (January 22) followed by his burial in the village cemetery.